The Interconnectedness of Nature: Truffles in the United States and Australia | Planet-TECH Associates: Trends. Innovations. Opportunities. In Chris Maser’s article Ancient Forests, Priceless Treasures, he discusses key principles of nature humans have frequently overlooked in land management initiatives. Perhaps the most important one is the interconnectedness of nature. “Everything in the world causes an effect, either positive or negative, for some part of the system. The world is balanced… the world functions perfectly without us [humans]. It always has”, he says. By the term “balance”, he means that every action exerted on nature has an effect on nature, whether we perceive this effect or not. Sometimes, we do not perceive this effect because it manifests itself where we least expect it… beneath the ground. In analyses of land management practices, people often focus on what we see above the ground as a sign of the health of the land. However, as scientists are discovering, and as I am coming to understand more and more in my research, what is below the ground is often just as important. In Maser’s article, he discusses truffles, which are fungi that play a vital role in the forest ecosystem. Maser dedicated much time to researching truffles in the United States and Andrew W. Claridge, a Senior Research Scientist with the Department of Environment, Climate Change, and Water in New South Wales, has dedicated much time to research of truffles in Australia. Maser and Claridge both came to see the importance of understanding the interconnectedness of nature through their research. Fungi, including truffles, protect trees by forming a sheath on the root-tip and stimulating root-tip production. Truffles help capture water and nutrients such as phosphorus and nitrogen from the soil to sustain the life of the plant. The fungi receive sugar from the tree in exchange. Because truffles have no means of dispersing their spores on their own, they have developed odors to attract animals to eat them. Native marsupials, for example, feed on truffles. These animals help spread the fungi by passing the spores through their digestive tract and into the forest soil. When part of this system is weakened, the entire system is impacted. Thus, there is an essential connection between the trees, the fungi, and the animals. When trees are cleared for farming, “up to 99 percent of soil-borne fungi species will disappear”. This impacts the truffle-eating animals, and renders the trees less able to absorb water and nutrients. In regions of Australia in New South Wales, more species of truffles than flowering plants have been found. However, deforestation threatens this diversity, for “as we simplify the above ground portion of the ecosystem… we simultaneously simplify the below ground portion of the ecosystem, which alters how soil, roots, nutrient cycling and nutrient uptake processes function and, consequently, how the land produces”. Everything is connected. I look at Australia with the understanding that the ecosystems here are very different to the ones I know in the United States. And yet, as we see from cases like this, nature is completely interconnected. Truffles found in Oregon and truffles found in New South Wales are not the same, but they teach us that the damage we inflict on the trees and the plants above the ground dramatically impacts the survival of the animals as well as the health and fertility of the soil. Deforestation is an unsustainable practice. Nature is complex, but no matter which ecosystem in the world we locate ourselves in, we can expect deforestation to have far-reaching consequences. I started off this blog piece talking about the “balance” of nature. As Maser describes, humans are disrupting the “balance” of nature. However, I think it is important to discuss the ways in which humans are also trying to reinstate this balance. It seems to me that through Holistic Management we are recognizing that we have disturbed the balance of nature, and that we must restore this balance. 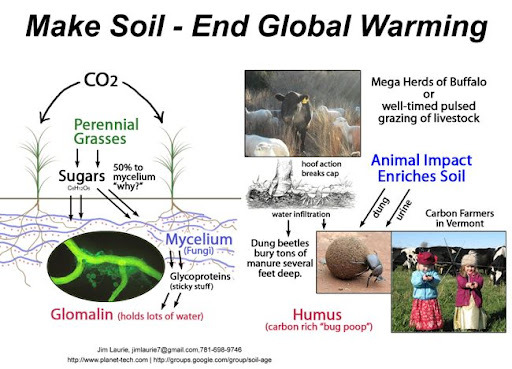 A Holistic Management approach to farming considers what is beneath the soil, above the soil, and in the air. It considers how humans have changed the land in the past, and how actions today can change the land in a more positive manner. In this way, Holistic Management analyzes how human action in the past (such as the destruction of megafauna) has affected nature, and creates means of reversing the damage. It is important to note that Holistic Management has been successful in many different environments around the world. It addresses the interconnectedness of nature, and uses this principle for the advantage of the land. Thanks to Jim Laurie for bringing this article to my attention, and connecting it with Andrew W. Claridge’s research. Maser, Chris. Ancient Forests, Priceless Treasures. Restoration Forestry: An International Guide to Sustainable Forestry Practices. Edited by Michael Pilarski. Kivaki Pr, 1994. Thomas, Abbie. "Native truffles are fun guys." ABC Science, http://www.abc.net.au/science/articles/2002/06/06/2589354.htm (accessed August 6, 2012).